NeXt Doc is a five-day intensive presented by The Carey Institute for Global Good and Youth FX that will bring together emerging documentary storytellers from diverse backgrounds across the country with award-winning documentary filmmakers to learn, share, and build their skills. Documentary filmmakers wear many hats; producer, director, cinematographer and editor, not to mention often working alone and with limited resources. From concept, filming and editing, to marketing and distribution, NeXt Doc provides an intensive look into the world of documentary film from the perspective of professional producer-directors. NeXt Doc 2017 will gather a dynamic community of emerging documentary filmmakers aged 18-24 at The Carey Institute's beautiful 100-acre campus in upstate New York and provide an inspiring five days of learning, sharing and creating. Youth FX is committed to amplifying the voices of people of color through digital filmmaking and storytelling. We especially encourage women and filmmakers of color to apply. 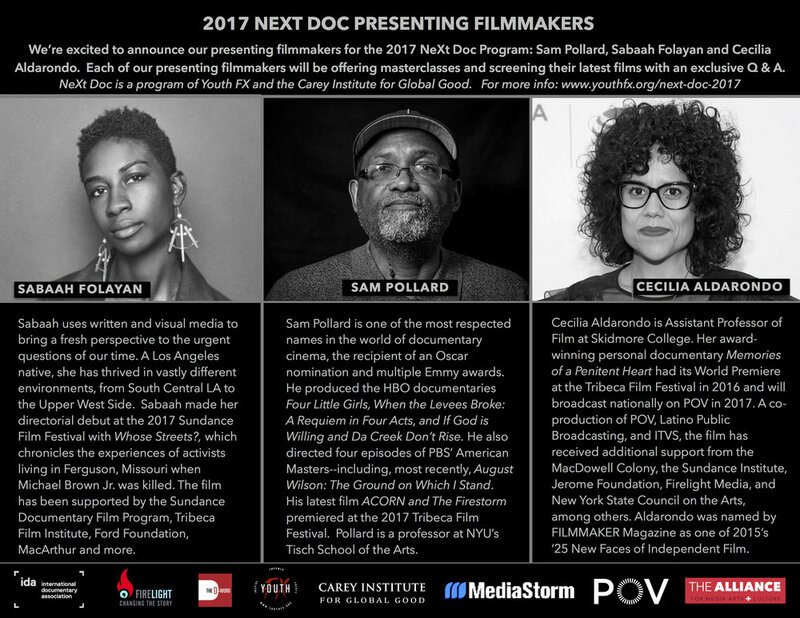 We are excited to announce our presenting filmmakers for the 2017 NeXt Doc Program: Sam Pollard, Sabaah Folayan and Cecilia Adarondo. Each of our presenting filmmakers will be offering a master class session and screening their latest films followed by an exclusive Q & A for NeXt Doc participants. Sabaah will present Whose Streets? which premiered at the 2017 Sundance Film Festival, Sam will present ACORN and the Firestorm which premiered at the 2017 Tribeca Film Fest, and Cecilia will present Memories of a Penitent Heart, which premiered at the 2016 Tribeca Film Fest and will air on POV this fall. We will also have workshops presented via Skype by Nikki Heyman, coordinating producer at POV, Brian Storm, founder of MediaStorm, and Doug Block, award-winning filmmaker and co-founder of the D-Word.